With its beautiful beaches and abundance of warm sunshine, Mexico has always been a destination for travelers looking for a little rest and relaxation. But, the country also has plenty of options for active travelers too, including some great places to go hiking. We've compiled a list of our favorite trails, just in case you want to go for a walk and stretch your legs while vacationing south of the border. Here are six can't miss hikes to do in Mexico. If you're up for an epic challenge, head to northwest Mexico to La Barranca del Cobre, better known as Copper Canyon. This amazing destination is rugged, wild, and mostly undeveloped, with the canyon itself spreading out across more than 10,000 square miles. And at 5500 feet in depth, it is deeper than even the Grand Canyon, making the rim-to-rim hike a significant undertaking. Many of the trails are not well marked, but that is part of what makes exploring the region such an adventure. Guided trips are available for those who prefer it. To beat the summer heat and heavy rains of early autumn, the best time to visit is November through March. For a truly wonderful hike that is sure to delight, head south from Mexico City to the small town of Tepozteco. Once there, adventurous travelers will discover a trail that leads up the slopes of the mountain from which the village derives its name. The route is a bit of a challenge due to the fact that it rises more than 1200 feet over the course of about a mile, making some of the sections quite steep. The altitude isn't particularly high however, which means it is an approachable ascent for those that go slow and steady. On the way up, take plenty of breaks and you'll reach the summit just fine. Once at the top, hikers are rewarded for their efforts with a 30-foot tall, 900-year old stone Aztec pyramid. Lounging on the walls of the structure, visitors can soak up the scenic views of the surrounding countryside in grand fashion. Don't forget to bring a few cervezas to enjoy after the walk, you'll definitely want to celebrate your accomplishment. The Desierto de los Leones (Lion Desert) is another fantastic destination for hiking that is also conveniently located close to Mexico City, The park itself often plays host to a number of historical and cultural events throughout the year, and is home to a 400 year old monastery. But wander deeper into the dense forest that surrounds the area and you'll find an intriguing wilderness that sits surprisingly close to the city center. To escape the crowds, and test your fitness, make the trek to the summit of Cerro San Miguel, the highest point in the park at 12,434 feet. It is a challenging walk that can test your level of fitness, but the views from the summit are well worth the effort. From there, the countryside spills out around you, with plenty to see in all directions. 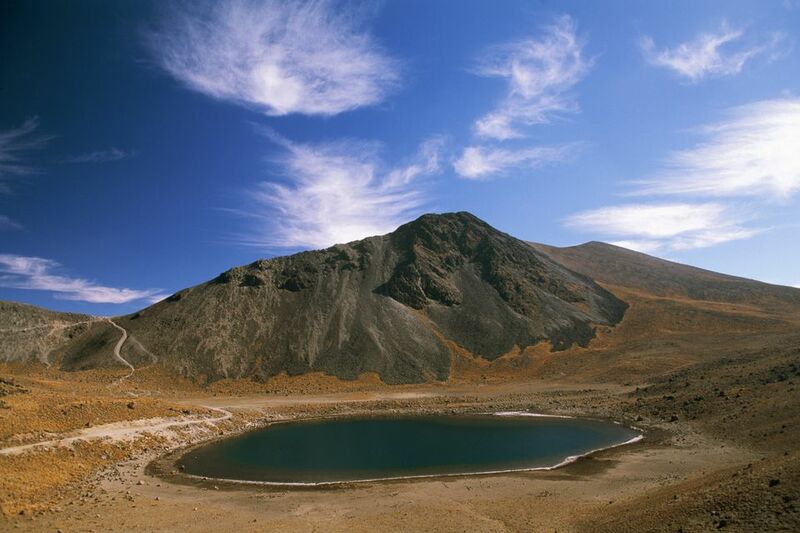 It's not everyday that you get to hike to the top of a dormant stratovolcano, but that is exactly what you can do on the trail up Nevada de Toluca. Located about 50 miles west of Mexico City near the town of Toluca, this massive peak stretches 15,390 feet into the air, making it a strenuous trek under the best of conditions. But even though the trail is a challenge, the scenery found along the way is breathtakingly gorgeous and includes a series of crystal-blue crater lakes found at various points throughout the walk. Before embarking on this hike, make sure you've fully acclimatized to the altitude by spending a few days in Mexico City or other parts of the region. Once you've become accustomed to the thinner air, it is easy enough to complete the trek in a single day, as the starting point is just 1600 feet below the summit and requires about two hours to make the full ascent. Be sure to bring a warm jacket with you when you set out, as temperatures can get quite chilly near the top. Once there, you're likely to see a rather unexpected sight –– snow covering the summit even during the warmer months of the year. The Cumbres Del Ajusco National Park is another easily accessible destination that has a lot to offer hikers. The park has a network of trails that criss-cross the region, cutting distinct paths through the pine forests that cover much of the area. But experienced hikers will want to head to the summit of Cerro Ajusco itself, a towering peak that sits 12,894-feet above sea level. There are several routes to the top ranging from moderately challenging to very difficult, but each is clearly marked, easy to follow, and offers its own rewards. The summit trails tend to be fairly quiet and peaceful, which can be a welcome respite from the hustle and bustle of Mexico City. Take your time on the way up, enjoy the views, and soak up the solitude long the way. Located in the Mexican state of Nuevo León, Chipinque is a breathtaking park that allows visitors to leave the busy city of Monterrey behind and reconnect with nature. It is a great destination for a number of outdoor activities, including cycling, camping, and of course hiking. Spread out over 30+ miles, the park has plenty of good trails designed for beginning hikers and grizzled veterans alike. Routes range in length from just 2.5 miles to as much as 13 miles, with plenty of good options in-between. No matter how much, or little, you feel like walking, Chipinque will provide a trail for you. Just bring your sense of adventure as there is plenty to explore within this park.